Crock Pot Cranberry Butter is an impossibly silky, tangy fruit butter that is made right in the crock pot ~ you’ll want to slather it on toast, scones, biscuits, muffins, turkey sandwiches ~ and so much more! This zingy cranberry butter has the most amazing crimson color and silky texture. While normally fruit butters are a time consuming project with a lot of stove side babysitting involved, in this recipe I’ve let the crock pot do all the work of cooking and reducing fresh cranberries down into a very potent thick spread. All you need to do is puree and strain. The result is truly unique. This recipe makes 2 cups of cranberry butter, but what it lacks in volume it more than makes up for in silky texture and powerful flavor. A little goes a long way, and a cup of this stuff would be a fine gift. Use it on biscuits, scones, or add it to a cheese plate. Use it as a glaze for grilled chicken or pork,or on sandwiches. You can make creative holiday cocktails with a dab of this, too. As an added bonus you’ll get an all day holiday scent filling your kitchen. 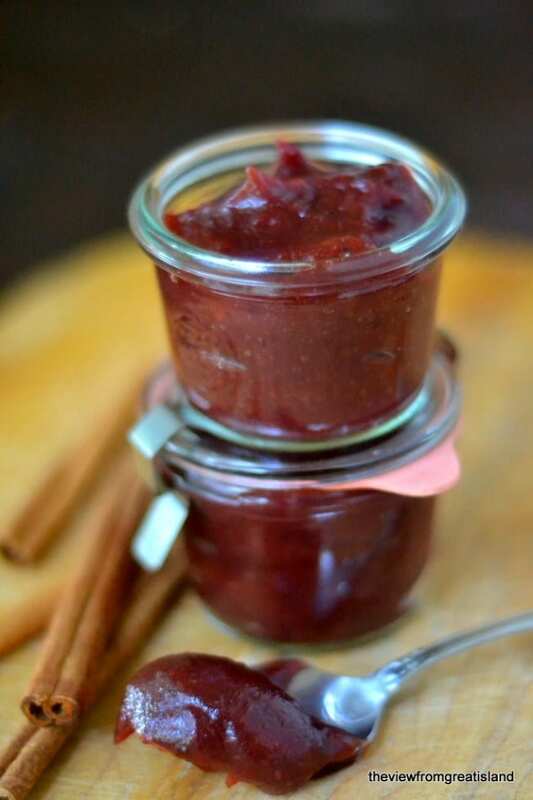 If you want to try other fruit butters, my Cranberry Apple Butter is a little less tart than this one. My Crock Pot Pumpkin Butter is a great choice too. 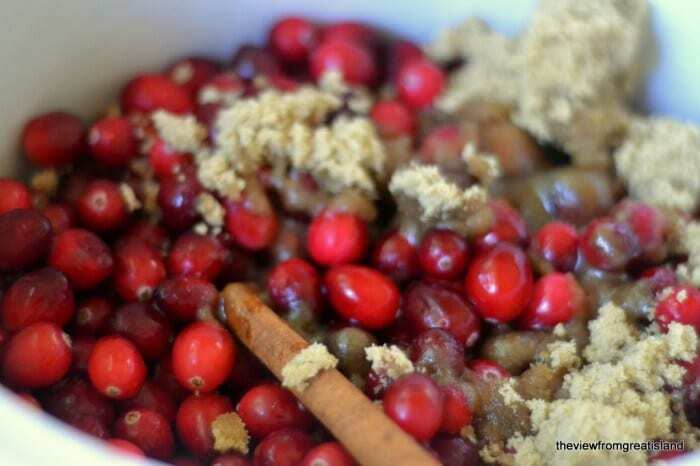 Be sure to remove the cinnamon stick before pureeing the cooked cranberries...I learned the hard way! 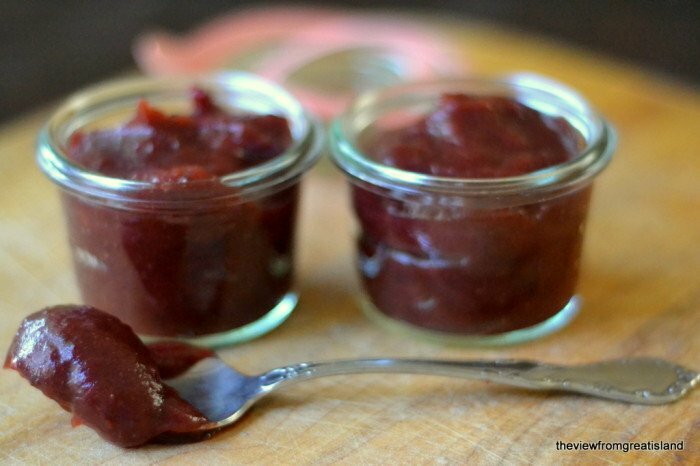 Thanks for pinning this easy Crock Pot Cranberry Butter! All the fabulous new kitchen blenders do such a good job! Yes, that will work fine in place of the cider. Gosh, I hate to just toss out the leftover solids . . . Wonder if they could be used somehow in cooking chicken or pork . . . I don’t know, Jen, as I remember there’s just a little bit and that tends to be cranberry peel and seeds that wouldn’t be too useful. This is delicious! I spread it on a cranberry walnut bread- SO good! I used an immersion blender to purée it, and found there were no chunks to strain. So I just put it all back into the crockpot at added a little pinch of salt. Delicious recipe! Thanks Coby, I’m so glad it worked so well for you. It can be canned if it has a ph level of 4.6 or lower. Since I made this as a small batch refrigerator recipe, I’m not sure about the ph. Cranberries are acidic, so it’s worth testing. You can also freeze it for longer storage. Okay so I love my cranberry sauce and eat it through the holidays but now that I have found this recipe I have already made it twice and had it devoured each time maybe a little more by myself than my family. Lol. I may just need to make this once a month because it is wonderful! After all that work, mine burned in crockpot when I returned it for thickening. Yes, I stirred several times, but each time I went back to it (every 10-15 min) it was burned on the sides and sometimes the top even had a ‘skin’ on it, all of which is now mixed into the butter. For me it turned out to be a waste of contents, time and effort. Not to mention it never thickened at all except for the burned parts. Very disappointed in this one. I’m so sorry to hear this didn’t work for you Janelle. I wonder if your crockpot runs high in temperature. Some people have luck with cooking the butter on the stove top for the final thickening, so you can be right there to control any sticking issues. Love this cranberry butter! Process is long & occassional stirring is a must, but well worth the process. Added to my personal recipe box! What do you use Cranberry butter for? I like to use it as a spread for toast, biscuits, and sandwiches, etc. It can be used just like cranberry sauce, as well, on a Thanksgiving table. Yes, definitely cook it some more if you can, it should thicken up fine. It was fine and very popular at the fair! I made this and it turned out great. didnt have cinnamon sticks so i used a teaspoon of ground cinnamon..and also added some extra brown sugar to lessen the very tart taste like other said they did. A co worker loves it and wants to make it and asked if you could use cranberry juice instead of fresh cranberries…does any one know that answer? I too would love to know if you can use cranberry juice. Do you mean in place of the apple juice Gayla? You could, but you might need to add a bit more sugar to sweeten the butter. But if you mean can you use juice in place of the cranberries, then no, you need the whole berries for this. To make “butter” you have to have the berry solids. If you just use juice, you end up with jelly. I think she was asking about replacing the little bit of apple cider in the recipe Ma. OH my gosh, I’ve been looking for something new to try with fresh cranberries. I’m so excited!! Our son-in-law loves to put cranberries on his turkey & sandwiches, lol more sauce than turkey!! I’m so happy I saw this! Could you use an immersion blender instead of the food processor ? Can I just put this in the 1/2 pint Ball jam freezer cups and freeze? 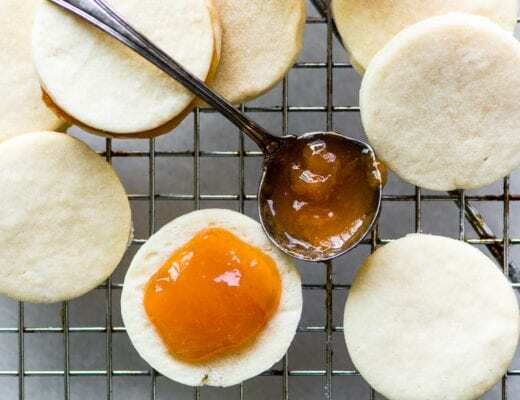 I make a freezer peach/apricot jam (using pectin) that I store this way and it lasts for months (or until my neighbors use it up!) Since this is just fruit and sugar, di I really have to water process to keep it? This will freeze well Lorrie. To make the cranberry butter as a preserve do you do a hot water bath after it’s jarred? Have you tried this with coconut palm sugar or a product containing stevia. I would like to lower carbs for a cranberry loving diabetic. Anyone have any ideas? You should be able to use any sweetener you like in this Sally. can you can this spread after it done? Thinking of changing the apple cider to orange juice as I love cranberry orange flavor. Would I just use vanilla extract instead of cinnamon stick or nothing else. What would be the best way to can this? Steam can or pressure can? I make apple butter and can it by boiling the jars and they seal on their own. I’m just not sure with cranberries. Ok, so I have made a batch of this and it is a family favorite already. I want to spice it up a bit since I have some jalapeños in their fridg that I want to use? What do you think? Cook with the cranberries the whole time or the second cook? Hmmm, interesting idea. I would be tempted to mince the jalapenos and add them in at the very end. I make this in large batches and can it. My family loves this year round in place of jam. Also I use maple syrup in place of the brown sugar and it’s delicious! What a lucky family! The maple syrup sounds so good, I’ll have to try it that way next time, thanks Hannah! 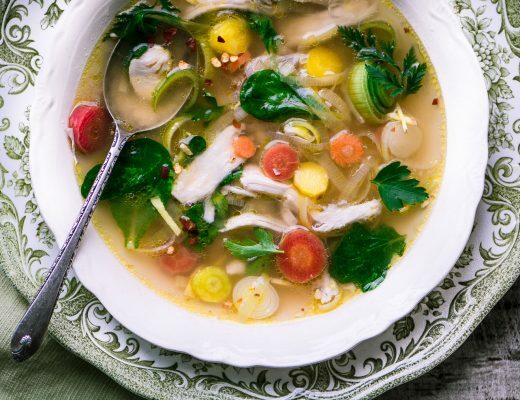 How can I ‘translate’ this recipe to an instant pot? I’m not completely sure, Deb, since I haven’t used one yet, but I assume you would do the same steps but they would be shorter. Let me know if you try! I made this tonight in my Instant Pot. I did 20 mins high pressure and a quick release. So, I only had a tiny (probably what most would consider half) of a cinnamon stick in the pantry to use. And, despite your many reminders, I forgot to take it out before processing. Cue moment of panic. But- either I just love cinnamon, the tiny half stick was not so strong, or my food processor did an outstanding job as a spice grinder, because it tastes just fine to me thankfully!!! This is going to be amazing to spread on crescent rolls at Thanksgiving! I really love this recipe. It’s my go to for the holidays? ?the only thing I do differently is after putting the cranberry puree back into the crockpot I add a little Nutmeg & Ginger. It’s fantastic I’ve been making it for 3yrs now. It’s not holiday dinner unless we have this cranberry sauce? That’s so nice to hear, Jessica, it makes me really happy to know that my recipe is a part of your holiday tradition :) Have a wonderful season! I am going to make this for Thanksgiving. How long will these keep in the refrigerator? At least a month, Susan. I made a batch of this and canned two jars and refrigerated the rest. The bowl in the refrigerator is completely gone and the first jar is opened (was thinking I would have it for Thanksgiving…..). Another batch now in the crockpot. I put the stick cinnamon but also added about 1-1/2 tsp more because I like more of the cinnamon flavor in the background. It is a huge hit! Going to try your other recipes next. How do you decide how long to do the canning hot bath? Is there a substitute for Apple Cider? Yes, you can use almost any liquid, Karen, even water. This looks great! I want to make it ahead of Thanksgiving just to have one less thing to do the day of. Do I serve it warm or cold? (This may be a dumb question but I’m new to cooking)! This recipe is used like apple butter, Sarah, so it would be served cold, and you can spread it on toast, biscuits, etc. It’s also great as a side condiment for Thanksgiving. Good luck! Made it and Love the cranberry butter. My grandson, who doesn’t like cranberries ate this up! Cranberries are due into the stores soon and I look forward to making LOTS of this yummy treat! I would like to know if Katie had any luck canning it? Have you heard any more form her? I think you can can this without problem, Harlee, I would process in boiling water for 10 minutes. Freshly extracted, unsweetened cranberry juice is valued between 2.3 and 2.5 on the pH scale, i’d add a splash of apple cider vinegar (or some lemon juice), to raise it slightly, this should make it shelf stable as its only safe to water bath high acidic foods. Ball typically calls for fruit butters to be water bathed for 15 minutes for pints, 10 minutes for half-pints. As for me, I hate the taste of cranberry’s, but I will probably make this as my wife and daughter love them. Thanks Ray, hope your wife and daughter love it! This stuff is great! So great that I’ve made it two years in a row without changing a thing. In other words, it’s perfect. It is worth it to get every bit of peel out. It makes a great sandwich spread for chicken or turkey sandwiches all year long. I made this during my days off and it tasted amazing. The onky thing that I had a question a out was that mine didn’t really thicken as much as I would have liked. Is there a way to thicken it and make it more spreadable and less watery? Keep cooking it, Christina, the longer you cook it the more it will thicken as the liquid evaporates. You can put yours back into a pan and cook it down. Enjoy! I just made a 1.5 batch of this for Thanksgiving tomorrow. It’s wonderful! I used an immersion blender – it worked perfectly. Thanks so much for the wonderful recipe! This is a new holiday favorite. Happy Thanksgiving! Happy Thanksgiving Amber – hope the family enjoys it! No, sorry, Denise, you need the fresh ones for this. My grocery store always carries them in the freezer section if you can’t find them in your produce aisle. How long do you cook thiis? I must have missed this in the post. It’s in the recipe section, Carla. The first part is about 2 hours, then you will puree the fruit, and then it goes back into the crock pot for approximately another 2 hours. Let me know if you have any other questions. Do you think you can water bath process this to make it shelf stable? I assume you can, Cassi, I would process it for 10 minutes. Just wondering if I can use regular cinnamon as I do not have sticks – if so, how much would you suggest? Well, probably just a bit because the flavor will get concentrated as the puree reduces, start with 1/2 tsp? This sounds terrific! How many jars (and what size?) does this recipe make? Honestly Amy this doesn’t make a lot, because the puree is reduced down so much to make a butter. As I recall it just makes one small jar, maybe a cup. But it’s worth it, and a little goes a long way! I just made this recipe the other day. I used a Vita Mix which purées very well. I did not waste anything by straining so therefor got 4 pint canning jars & some extra for the fridge. I also found it extremely sour so added at least double the sugar. These factors probably are the reason for me having more quantity. I also did a canning in water process to make sure it keeps longer. Hope this helps anyone’s concerns. Cranberries in crockpot! Made the NewYork cheesecake from Pintrest, will serve this on top……can’t wait ! Is there another way to appropriately puree this without a food processor? Would a handheld mixer or magic bullet work? The bullet, probably, the hand held mixer, no. If you have an immersion blender that would work, and they are very inexpensive. I can’t wait to try this recipe … it sounds delicious, and my favorite part of a Thanksgiving meal is the leftover sandwich later in the day, I throw a bit of everything on that bread and I bet this cranberry butter will make a yummy addition. Yes! Also, if you happen to add some bacon, it becomes amazing! I’m not on the current bacon bandwagon, but it works so well in that application and with the cranberry. I’m hoping I can can this! Hmmmmm, not too sure. Might be better to save your jellied cranberries and start from fresh. So very yummy. Just took it out of the crockpot and had to try it on some toast. I was wondering if u ever try canning it? Thanks for the recipe. I haven’t tried, Jenny, and I’m not an expert canner so I can’t advise you. I find that it lasts pretty long in the refrigerator, and you could certainly freeze it. It looks like there is no reason it can’t be safely canned. I’m going to add 2 teaspoons of lemon juice to increase the acid, just to make up for the cider. But the difference between this and cranberry sauce is method, not ingredient, and that’s cannable. You can safely can fruit spreads, so I don’t worry about density (as with pumpkin). Adding spices doesn’t affect acidity, so the cinnamon doesn’t bug me. I’m gong to water-bath it according to the directions for whole-berry sauce. As an extra precaution, you could test the acidity with litmus paper. But cranberries are not usually questionable. Thanks for weighing in, Katie! It depends how thick it is. If too thick, won’t get even heating all the way through. It will be acidic enough as the acid will become more concentrated as it cook down. litmus paper does not safely test food as it needs to be checked in different places in the jar and at different times, eg. month after, two months later, etc. Safe canning is a science. I love using my crock pot and I love cranberries! I think my bags were slightly bigger, but I used the same proportion of other ingredients, using coconut sugar. I pureed everything (minus the cinnamon sticks!) in my blender so I didn’t have to bother with straining. Added just a bit of liquid stevia since I decided it could use a little extra sweetness, and canning it right now. Thanks! did you find the skins to add too much texture to the end result? I strained the butter to remove the skins, Sarah, and I really liked the silkiness of it, but you don’t have to, it’s up to you. I made a big batch of this (4 12oz bags of cranberries). I changed the recipe some (less sugar as I am hypoglycemic) and I added ground cloves, nutmeg, and a couple of apples (for sweetness). I used a Foley food mill to process it, and am getting rave reviews! 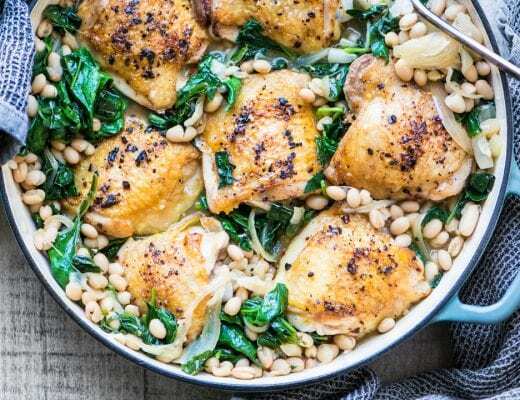 This is now in my permanent rotation for fall cooking!! Yum!! How would I do this on the stove? I don’t own a crock pot unfortunately. I also don’t have a food processor or blender but I’m sure one of my neighbors would have one I could use. You can definitely do it on the stove, you’ll just have to watch it closely as it gets toward the end of cooking so it doesn’t scorch. Just cook it until it is thick. You will need that food processor, though, to get it smooth. I would think either one would be ok, the grape juice would probably be my choice. Can this be made with honey instead of brown sugar? I loved this! So did my friends. Their reaction, “Oh wow”. Served with apple scones, cheese and crackers, and a glaze for poultry. Would be good on pork as well. I cooked it a bit longer as I was also assembling other things. I also pulsed it in food processor for a bit longer and avoided the straining step. Result was beautiful, smooth and tastey. Thanks so much for sharing. This will be my Christmas gift. and donation to autism auction. I love your friends’ reaction…that was mine, too! I’m honored that you’ll be donating this to the autism auction, and have a happy holiday season, Pat! Good for you — I hope the crowd likes it! Is this thick enough to use for thanksgiving cranberry sauce? From the pictures it looks wonderful! Hey Jessica — it’s thicker than cranberry sauce, but I wouldn’t use it that way — this butter is very intense, if you want to use it at Thanksgiving it would be better used as a spread with biscuits or cornbread! I have lots of great cranberry sauce recipes on the blog if you are looking for one, just type in cranberry sauce in the search bar! Can you use a food mill instead of the mesh sieve? I see a strainer works too, but thought I would ask. I used a metal strainer, just the regular kind Madeleine. But a food mill would work, too. thanks! It’s in the crockpot now! i even put it on my peanut butter toast! i love the jars in the picture! where could i buy these please? Going to try this recipe in the morning. I might throw in orange peels. Can you can these in water bath? I’d like to give them out as gifts during the holidays. Thanks! You definitely can can them :) Just do as you normally do with the boiling, and they should be fine! Am half way through my third batch. I love this stuff, could take a bath in it if it lasted that long. I’m going to try a water bath so I can keep it longer. Sue never stop with these great recipes. My girlfriend and I made up a batch last weekend, and thought it was great. This weekend, we brought it back out with flatbreads, brie and bleu cheese, just to see which it might go better with for putting out at a party. We were floored! With the brie, and it’s subtle flavors, it came across tart and brought a load of flavor along. With the bleu’s tartness, it came across as sweet and subdued, perfect accompaniment for either. Ultimately, we decided that for the party, we’re just putting both cheeses on the plate, so we can watch people’s faces as they try it either way! Such a wonderful color, this would be delicious with muffins or scones! How clever of you – such a time saver. Cranberry Butter – my life is complete now. I love them both and together must be magical. I will be making this soon. Can the cranberry butter be frozen? I don’t honestly know since I haven’t tried, but since cranberries freeze well, I’m thinking it would be fine. I must try this. I make a Cranberry Amaretto Chutney but this sounds divine. I will definitely double it as I like to give things like this as little thank you gifts. Thank you. If you double it, Sherry, just be aware that the second stage of cooking will take a bit longer, so plan accordingly. Wow Sue – another beautiful jar of awesomeness! You know this might be good added to a little buttercream icing tucked in between two macaron cookies – and what a gorgeous color. It certainly does look silky :) Hope you have a blessed Thanksgiving! You’re right, because it’s so intense you can use it as cranberry flavoring. Happy Thanksgiving to you, Tricia! I’ve got a bag of cranberries in my fridge that I’ve not known what to do with! Do you think halving this recipe would work? I was thinking could cause burning/drying out. This looks so delicious, I can’t wait to try it out. Hi Kate— I originally made it with a little more than a bag, and it worked, but you won’t need as long for the final crockpot reducing. You might even be better to do that in a small saucepan on the stove for such a small amount. Thanks- I did reduce it in a pot, turned out just wonderful! I’m thinking cornbread needs to be made to use this on tonight. I imagine this will be the perfect spread for leftover Thanksgiving sandwiches! Thanks for the recipe!